According to Eastern Mysticism and Tantra it is very much possible to transfer one's consciousness from one body to another which will give new insights into our understanding of Consciousness and this phenomena is perfectly in accordance with the dualistic model of Mind and Body. Although practices like Phowa are considered to be the path of the Left it is very much important to study them as it provides empirical evidence for the existence of soul and consciousness independent of the human body proving that physicalism is false which many stupid scientists stubbornly adhere to. After debating for over fifteen days, with Mandana Misra's wife Ubhaya Bharati acting as referee, Mandana Misra accepted defeat. Ubhaya Bharati then challenged Adi Shankara to have a debate with her in order to 'complete' the victory. She asked him questions related to sexual congress between man and woman - a subject in which Shankaracharya had no knowledge, since he was a true celibate and sannyasi. Sri Shankracharya asked for a "recess" of 15 days. As per legend, he used the art of "para-kaya pravesa" (the spirit leaving its own body and entering another's) and exited his own body, which he asked his disciples to look after, and psychically entered the dead body of a king. The story goes that from the King's two wives, he acquired all knowledge of "art of love". The queens, thrilled at the keen intellect and robust love-making of the "revived" King, deduced that he was not their husband, as of old. The story continues that they sent their factotums to "look for the lifeless body of a young sadhu and to cremate it immediately" so that their "king" (Shankracharya in the king's body) would continue to live with them. Just as the retainers piled Shankracharaya's lifeless corpse upon a pyre and were about to set fire to it, Shankara entered his own body and regained consciousness. Finally, he answered all questions put to him by Ubhaya Bharati; and she allowed Mandana Misra to accept sannyasa with the monastic name Suresvaracarya, as per the agreed-upon rules of the debate. 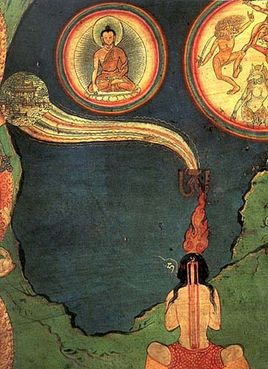 According to Tantra there are three different teachings of the Transformation practices: the special Transformation Yoga; the Teaching of the self-mind (or soul) entering into another's corpse; and the teaching of expelling another's soul from his body so that one's consciousness may enter this body. All these three Transformation practices require, first, the capability of closing the nine gates by words; second, the mastery of Vase Breathing, by means of which all the pranas of different organs are gathered and entered into the Central Channel; third, the mastery of Tumo, whereby the small Ah-word of the red-element in the navel center is able to attract and hold the wisdom Hūṃ word (which is the rider of the subtle prana) at the Heart Center. This is said in the Tantras of Vajra Dakini and of Gdan-bzhi and in their common commentary Bhaba Bhad-ras; and in the Tantra of G’a-sbyor and its commentary, the Fruit-Bearing Pith-Instruction. I believe that in both cases, whether the self-consciousness enters into the corpse or into another's living body, a special prana performance is required in addition to the requirements and qualifications mentioned before. The details may be found in some other sources. It would be difficult to benefit sentient beings on a great scale with a low-born human body; therefore, it is desirable to have a human body of high class to accomplish the undertaking. Because the possession of a sick, aged, crippled body would handicap self-improvement as well as altruistic deeds, one resorts to the Yoga of Entering Another's Body to procure a fair and healthy body. According to gurus there are three requirements for practicing this Yoga: first, the person who intends to practice this yoga must have an infinite compassion for all sentient beings; he must be absolutely sure that great benefits and boons for sentient beings will be achieved if he performs this yoga; he also must have mastered both prana and mind. A yogi who meets these requirements and conditions may then proceed to a very secluded, sheltered place. He should dispense with all distracted thoughts, keep away from all wordly activities, prepare the offerings, and establish the altar for the patron Buddha. With all these arrangements made, he should then engage himself in meditation under strict Confinement of Contemplation104. Then he should prepare a Mandala painted black as the supporting-platform and put a human skull on it. In the center of the human skull a Hūṃ word should be clearly written with a white stone (chalk). Visualizing himself become the Patron-Buddha, he then recites and meditates on the prayer of Seven Wishes of Bodhisattva Samantabhadra. Then the yogi visualizes a Hūṃ word in the center of the heart, and, when the exhalation goes through the right nostril, he should think the Hūṃ word comes out along with the exalted air and enters into and is identified with the Hūṃ word in the skull. Meantime the yogi should hold the air outside as long as possible. When he cannot hold it any longer, he slowly takes the air in. Then he exhales and visualizes as before. Continuing this practice for a while, the yogi will see the skull shake, jump and move—these are the signs that will appear. The yogi may now proceed to the actual transformation of soul. First, he should procure a fresh corpse with no signs of decomposing, not being dead from any injuries or disease; or he may procure a clean and fresh corpse of cattle or any livestock. Then he washes the corpse with clean water, decorates it with pleasing ornaments, and places it well on the Mandala in a sitting position. Then, the yogi visualizes the Hūṃ word which symbolizes the mind, both in his own heart and that of the corpse. He then arouses his prana to drive the Hūṃ word out through his right nostril and through the corpse's left nostril into the Hūṃ word at the Heart Center. If the yogi practices this again and again, the corpse will start to breathe and to regain its senses. When these signs take place, the yogi should know his performance is effective and should (temporarily) stop the practice. When the yogi is ready to carry out the real performance, he should release himself from the Confinement and go out to find a qualified and fresh corpse, bring it back, and place it on the Mandala facing him. Having decorated the corpse, the yogi then visualizes the self-Yidam-body and lays aside the attachment to the vulgar human body. He then reminds himself that all Dharmas in the cosmos are magic-like and illusory. Now it is time for him to cut off all vulgar, fallacious thought, as well as delusory habitual thinking, and render his body as an offering to the gurus and guards. With great earnestness, he should pray them to protect him from all evil hindrances and influences. Then the yogi should clearly visualize both himself and the corpse transformed into Patron Buddha and vividly visualize the Hūṃ word in the Heart Center of both. Then the yogi contacts the air-gate of the corpse and actuates his prana to drive the Hūṃ word in his Heart Center out through his right nostril and into the Hūṃ word of the corpse through its left nostril. At this time the yogi should pull up all his strength to aim at the Hūṃ word of the corpse with his prana-mind. By means of this exercise, the corpse will begin to breathe and jerk, etc. Whereupon, the yogi's friendly companions should take care of him, foster him with proper food for half a month in a solitary place. Until the yogi can stably live with the new body, he should not appear before people. In order to express his gratitude to the deceased one, the yogi should perform the Offering Rituals, such as the Ritual of Tsa Tsa and the Ritual of Burning Performances. With this new human body, the yogi should devote himself to the welfare of sentient beings on a great and broad scale. These instructions were given by gurus. Thus, the instruction on the Yoga of Entering Other's body which are based on the genuine contents of (several) Tantras and their commentaries has now been given here without wavering ambiguity.